Where to Buy Roundup QuikPRO 6.8 Lb, Roundup QuikPRO - 5 x 1.5 Oz - 6.8 Lb - $71.95 for Sale with Fast Free Shipping! 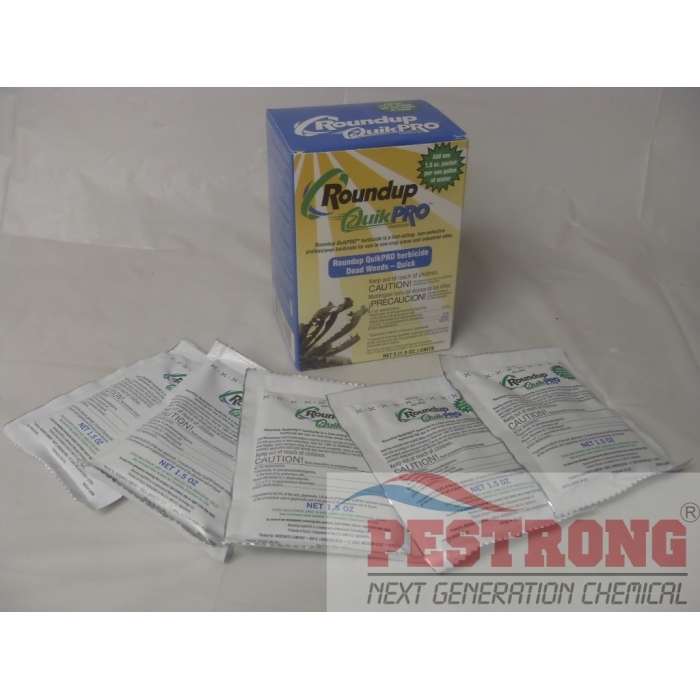 Roundup QuikPRO - 5 x 1.5 Oz - 6.8 Lb is generally non-selective and gives broad spectrum control of many annual weeds, perennial weeds, woody brush and trees. Surge Herbicide Fast Broadleaf Weed Killer.. It is 24 hour weed killer post emergent, systemic herbicide with no soil residual activity. With QuikPRO there is simply no better choice for immediate, visible results and unsurpassed weed control. 1.5 oz per 1-2 gallon of water. Choose 5 of 1.5 oz pack or 6.8 lb jug. Works fast as intended. Got rid of weeds in one day as advertised. Don't have any complaints with this product! With Pestrong's price and the free shipping, it's definitely a 5/5 experience. Tried this out and I loved its potency. I'm buying more. Great product, have used for years now. Contains Glyphosate 73.3% which is round-up & provides a systemic root kill. Also contains Diquat -- 2.9% which is a contact herbicide that produces rapid defoliation and is the ingredient responsible for the fast browning and burn down of the plant. Quick-Pro is our choice for residential accounts where a rapid visual burn down is needed, or when pop up showers are expected as its rain fast in one hour. I tried this product based on fact that my landscaper used and recommended it. This product does exactly what it says it will do. It is a non-discriminant and will kill everything. If that's your intention, I highly recommend this product. As for the price, this price from Pestrong is a tremendous value. It would be very hard to beat. 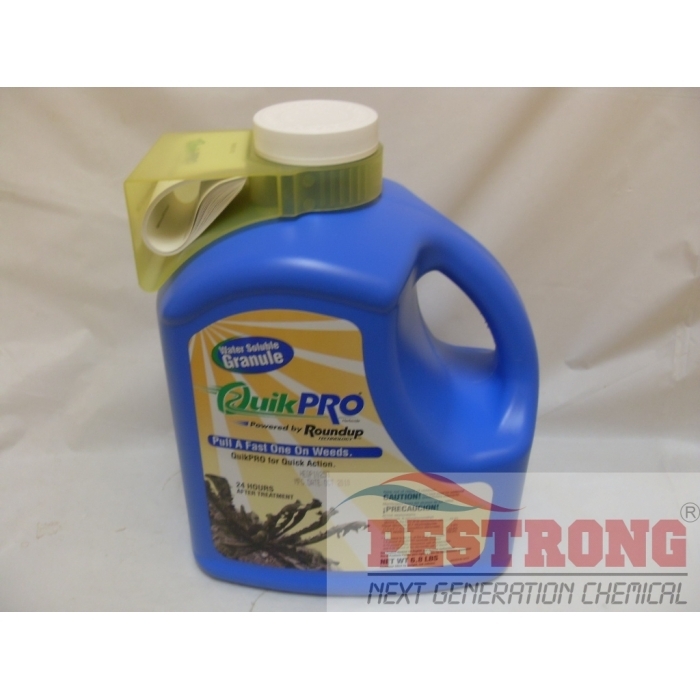 I can't recommend both the Roundup Quikpro product and Pestrong enough. Shipping was also extremely fast. Top notch product and seller. Superb fast shipping. Best pricing that I have been able to find. Product concentration just takes a little time to dial in; balancing effectiveness of product while using as little as possible. 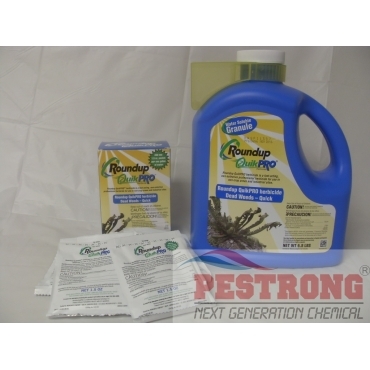 The Roundup QuikPro weed killer is a wonderful product. I have successfully used this product for many years and found it to be the most effective on the market. I highly recommend it. This is easy to mix and more economical to use than the premixed Roundup. It kills all the types of weeds on my property. I sprayed this on a plant, and a couple days later, it's wilted, brown and near death. A week later, I just pick the dried remains off the ground. I haven't found anything this doesn't kill, and I almost never need to spray a second time. Avoid the pre-mix junk from the hardware store, this is Roundup that actually works! Greaqt Pricing and Fast Shipping! Great value for controlling all unwanted vegetation.Pestrong has the best price on the 'net.I'll definitely order from them again. This worked great! I mixed it with Scythe and weeds were dead/brown within 24 hours. I highly recommend this combination for non-selective herbicide. When using saw noticeable results within 24 hours. Appears to work quickly.